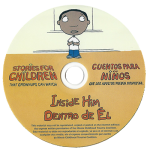 “Stories” is an innovative set of materials that identify and highlight warning signs resulting from childhood exposure to trauma and violence. The goal is to raise awareness of the need to prevent, identify and treat exposure to trauma and violence in young children and to provide resource information for families. The target audience is infants and children under age of 6, and their parents, caregivers, and service providers. The links below are orientation webinars (both mp4 and PowerPoint with audio versions) for practitioners and clinicians. They provide an overview of the Stories project and provide details on the three modules, including all of the tools available and their recommended use. Lulita had heard her parents arguing, really loudly. It frightened her and she had become clingy like a bug. “A Clingy Thing” is about the clinginess and insecurity that can come about from exposure to violence and trauma. 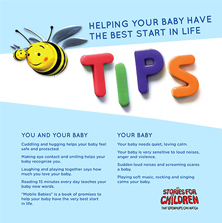 It includes tips for responding to children exhibiting symptoms. Eddie was really bothered by the things he had seen and heard but was very afraid to talk about it. 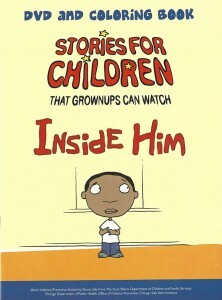 "Inside Him" is about how adults can help children talk about what they have seen or heard that might be upsetting to them. 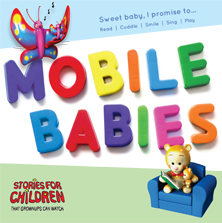 A mobile hangs sweetly over a baby’s crib, and the butterfly, bee and teddy bear hear all that happens in the house. 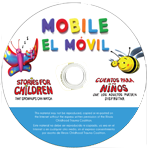 Mobile focuses on how infants react to conflict, and provides parents and caregivers tips for keeping infants safe and happy.